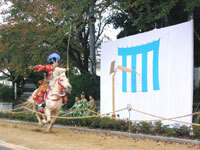 Yabusame is the ceremonial art of shooting whistling arrows at a stationary target from the back of a galloping horse. Historical records of the custom can be found dating from around the end of the Heian period (794-1191), and it is believed that the custom was observed even earlier. In the Kamakura period (1192-1333), the sport came to be practiced as a divine rite offered by warriors to temples and shrines, in hopes of victory in battle, and in that way, the ceremony came to be observed at religious centers throughout the country. Other martial equine arts seen in ancient records include target shooting and "dog hunts" with the use of blunt whistling arrows (kasagake) ; yabusame likewise developed as a means of practicing the warrior arts, but also as a divine performance or offering. The custom of yabusame was interrupted in the strife-ridden Muromachi period (1334-1573), but in the Tokugawa era (1600-1867), the eighth shogun Tokugawa Yoshimune (shogun 1716-1736) revived the custom, and it has continued to the present day. The current practice of yabusame is almost exclusively considered a religious rite : in addition to the aspect of offering involved the results of the shooting of the three targets are used as a means of divination for the year's harvest. The ceremonial yabusame observed at the Kasama Inari Jinja is dedicated both as a ritual of harvest divination - a subject with obvious and deep associations to the deity Inari Okami - and also as an element of Japanese culture. 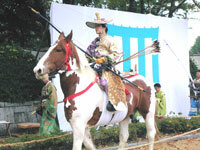 In order to preserve the ancient principles and techniques of the Ogasawara school - one of the two major styles of yabusame - a special equine training facility was built on the site of the old Kasama domain mounted archery grounds. Together with the rites held at the Tsurugaoka Hachimangu (Kamakura) and the Toshogu (Nikko), the yabusame observed on November 3 at the Kasama Inari Jinja is counted as one of the three great yabusame in Japan's Kanto region. Some 100,000 visitors gather at the Kasama Inari Jinja each year for the event, enjoying a veritable tableau vivant of Kamakura warriors, a historic depiction come to life before their eyes. 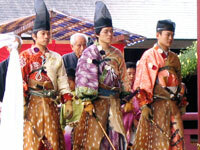 The yabusame rites held at the Kasama Inari Jinja are realized through the concerted participation and cooperation of large numbers of people. 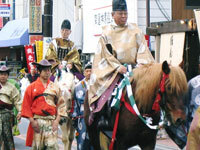 These include the shooters from the Ogasawara school of mounted archery, dressed in their meticulously recreated costumes, as well as members of the Kobudo Shinkokai (Society for the Promotion of old Martial Arts), parishioners of the Kasama Inari Jinja, and interested citizens, together with the mayor and police chief of the city of Kasama, who act as Grand Marshals (sobugyo) for the competition. Preceding the ritual, the participants gather before the shrine's Hall of Worship where they pray for a successful conclusion of the rites, after which they proceed in accordance with ancient precedent to the special equine archery grounds. At the grounds, cedar targets are set up at three locations on the horse run ; the first is erected some thirty meters from the start, the second seventy-five meters from the first, and the third seventy-five meters from the second. Each target is erected at a height two meters from the ground. The rider spurs his horse from the start, and is required to shoot a whistling arrow at each of the three targets, all in a period of only about twenty seconds. The Grand Marshals judge the hits, which are used to divine the coming year's harvest. Ogasawara Kiyotada,31st Master of the Ogasawara School of Equine Archery.